Mark Clattenburg is quitting his job as a Premier League official to become Saudi Arabia's new head of referees. Howard Webb, another former top-flight official, resigned as Saudi Arabia's head of refereeing 11 days ago. Clattenburg is expected to leave before the next Premier League fixtures. His new post will involve working with Saudi referees to improve performance and professionalise the set-up, while he will also take charge of some league games. He has signed a one-year rolling contract. Speaking on a live broadcast on the Saudi Football Federation's Twitter page, Clattenburg said: "This is an important move forward. We have professional referees in the country that I am leaving, which has been a big positive. "One thing I'd like to do is work with the refereeing team and the president to make this happen so that it will be successful for many, many years to come." The Premier League's referee body, Professional Game Match Officials Limited (PGMOL) said he had been "a great asset" and "an inspiration to those who want to get into refereeing". Its statement added: "We understand this is an exciting opportunity for Mark, and it further underlines the high esteem for English match officials throughout the world game." Clattenburg took charge of his first Football League game as a 25-year-old in 2000. Four years later, he was promoted to the Premier League's Select Group. Unusually for a match official, public attention has often been drawn to his life off the pitch. 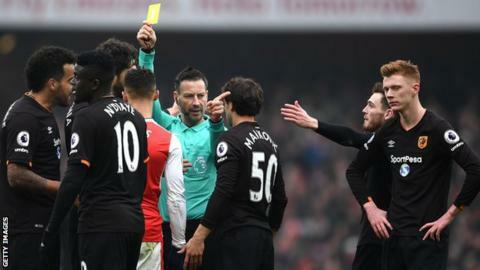 In 2008, Clattenburg was suspended following an investigation into allegations he owed £60,000 as a result of a failed business venture, and he later had his elite referee status revoked. However, at an appeal in February 2009, his punishment was reduced to an eight-month suspension, backdated to August 2008. In October 2014, he was dropped from officiating for two breaches of protocol - speaking on the phone with then-Crystal Palace boss Neil Warnock, before leaving a ground alone to drive to an Ed Sheeran concert. PGMOL says officials must travel to and from the ground together for integrity and security. And last summer he got two tattoos to commemorate refereeing the Euro 2016 and Champions League finals, and the Guardian reported he had a car with the registration plate: 'C19TTS'. In an interview with Associated Press in December, he said he did not understand why "people see [the tattoos] as a negative thing", adding: "I'm proud of what I've done." What's the Saudi league like? The Saudi Professional League is one of west Asia's strongest domestic leagues, although the national team has not qualified for a World Cup since 2006. Saudi clubs have reached three Asian Champions League finals since 2009, with Al Hilal losing to Australia's Western Sydney Wanderers most recently in 2014. The league is dominated by Saudi players, who rarely move abroad, while each club can field three overseas players and one Asian player. Former Blackburn Rovers midfielder Carlos Villanueva, a Chile international, and Greek international winger Giannis Fetfatzidis are some of league's more notable foreign players. The five biggest clubs - Al Hilal, Al Shabab and Al Nassr in Riyadh and Al Ittihad and Al Ahli in Jeddah - all have grounds that hold more than 60,000 fans. Clattenburg indicated in December that he was prepared to work abroad, but the timing of his departure has still come as a big surprise to those in the game. The deal was concluded so quickly that it remains unclear if he has taken charge of his last Premier League game, and what this move will mean for his hopes of refereeing at next year's World Cup. Clattenburg could be colourful and controversial. He made mistakes, yet he is widely respected in world football and questions will naturally be asked as to whether more could have been done to keep him in the English game. His departure is a blow to the Premier League which has just lost its best referee in the prime of his career.